One of the IAF's CH-47FI Chinook during tests in the US. The Indian Air Force (IAF) formally inducted the first four (4) units of Boeing CH-47FI Chinook heavy-lift helicopters, during ceremonies on 25 March 2019 in Northern India. A total of fifteen (15) units were ordered by India in 2015 under a US$1.1 billion deal, with the rest of the helicopters expected to be completely delivered to the IAF by March 2020. These helicopters will replace the Soviet-era Mil Mi-26 "Halo" heavy-lift helicopter which has been in service with the IAF since the 1980s. 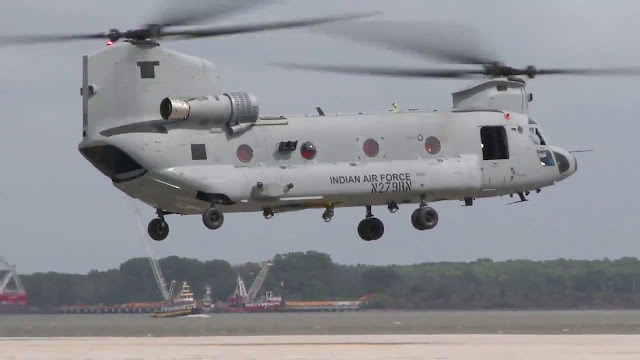 The CH-47FI (for India) is a variant of the new CH-47F Chinook helicopter, with Indian-specific enhancements as part of the IAF's program to increase local content in its aircraft fleet. The first 4 aircraft were delivered to India in February 2019, and were assembled in India before being ferried to Chandigahr Air Base, north of New Delhi.